Málaga is a fantastic starting point for some of the most exciting day trips in Andalusia. Within just a couple of kilometres you will easily find tons of history, vibrant cities, great culture experiences and unforgettable landscapes. The following 20 day trips from Malaga will explain what you can see and how to get there by car, guided tour or public transport. No matter whether you would like to tour white villages or great ancient cities, unspoilt nature reserves or family fun activities, these day trips from Málaga will show you the most unforgettable places in southern Spain. Before we introduce you to 20 of the best day trip destinations from Málaga, a quick word about how to reach them. There are also busses and trains departing Málaga. Málaga’s main train station Alhameda is to the west of the city centre. From here you can catch trains to other larger cities in Andalusia such as Seville or Córdoba. Trains are operated by state-run Renfe, and you can buy tickets online. They are quick, clean and efficient and a joy to ride. You can find everything you need to know about trains departing from Málaga here. 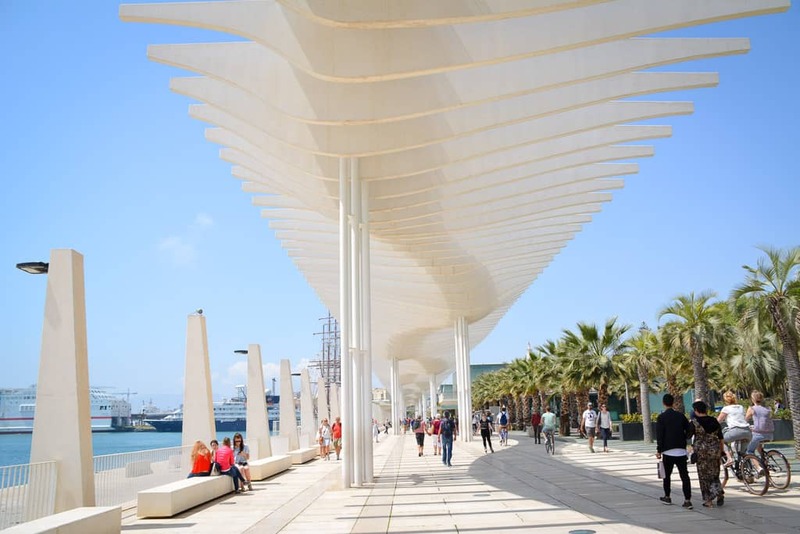 There is also a local train service connecting Málaga with the western part of the Costa del Sol including Benalmádena und Fuengirola. A lot of other places in Andalusia can only be reached by bus, for example Tarifa or Frigiliana. You can catch busses from the main bus station near Paseo de los Tilos. The ticket kiosk is nearby. More info on how to catch busses from Málaga, click here. If you prefer joining a guided tour from Málaga, you’ll be pleased to hear that you have a great selection to choose from. We will give you recommendations where applicable. The Puente Nuevo in Ronda is a popular day trip destination from Málaga. Pretty Ronda is one of the most popular day trip destinations in Andalusia. Most people visit Ronda to enjoy the views from the Alameda del Tajo and to see the spectacular bridge Puente Nuevo. There is also a remarkable bullring and a wealth of other cultural attractions like the Arab Baths that you can see in Ronda. We recommend a visit to Museum Lara which has a great collection of unique vintage design pieces as well as an exhibition on the Spanish Inquisition. Car: Via A-357 and A-367, approximately 1 hour 30 minutes. Train: Change train in Antequera-Santa Ana, approximately 2 hours. Bioparc is one of the best zoos in Spain, a perfect day trip destination from Málaga for families with children. The animal population is focused on animals from the tropical forests around the world. Unique to this zoo: In July and August you can visit the Bioparc until 11pm. This allows you to carefully observe the animals in the gentle shine of artificial moonlight. For more info and to buy your tickets online, visit the official website. Car: Via A-7, approximately 40 minutes. Train: C1 Local Train to Fuengirola (last stop), approximately 1 hour. The beaches and caves of Nerja are a popular day trip destination from Malaga. Nerja is a pretty little seaside resort just east of Málaga. Visit Nerja for a stroll around the city centre, a dip in the ocean, and to soak up the amazing costal views from the Balcón de Europa. Then head to the famous Caves of Nerja to see first-hand where some of the first humans lived in Europe. Bus: Busses from Málaga will drop you in proximity to Nerja town centre but you will still have to walk another couple of minutes to reach Nerja. The caves are also not directly connected to Málaga bus station. Taking the bus to Nerja is therefore not recommended. Mijas is a great place for amazing views of the Costa del Sol. In fact, it’s the perfect place to get away from it all. 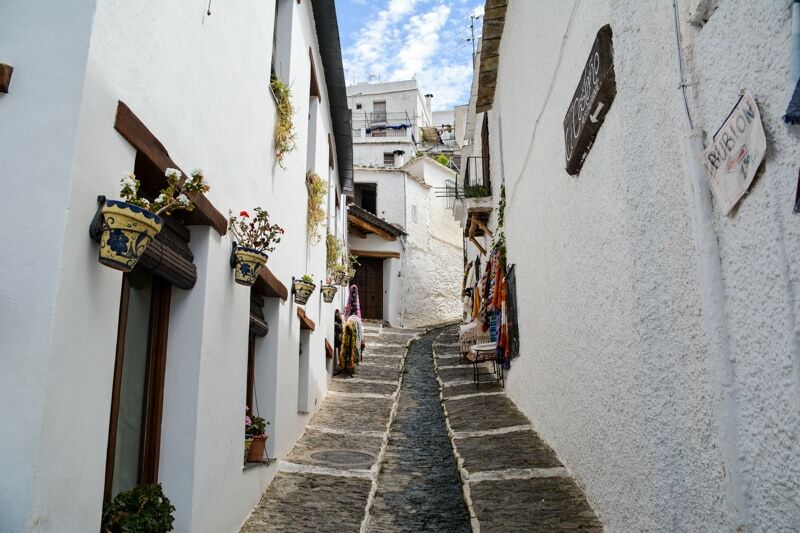 Mijas is a very accessible white village which makes it an ideal Málaga day trip destination. The village is located in the mountains, just a handful of kilometres from the popular beach resorts of the Costa del Sol. Yet, despite this proximity to modern tourism sites it is a different world altogether. Biggest drawcard of Mijas Pueblo are the many terraces from which you will have commanding views of the mountains and the sea, but you can also find excellent restaurants and souvenir shops in Mijas. 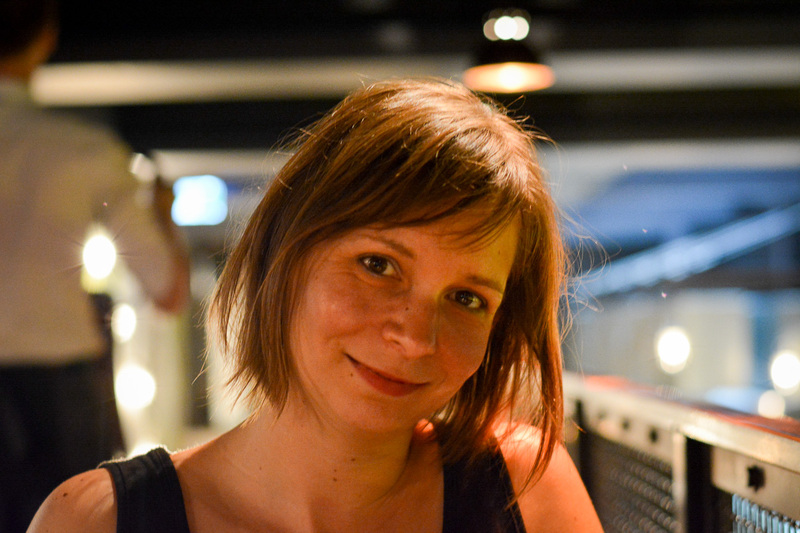 More info in our blog post. Train: C1 Local Train to Fuengirola (last stop), approximately 1 hour, then change to local bus. In the very south of Spain, the small town of Tarifa beckons with a well-rounded set of experiences. Climb the ramparts of the impressive castle and watch the ferries on the Strait of Gibraltar travel to Africa. 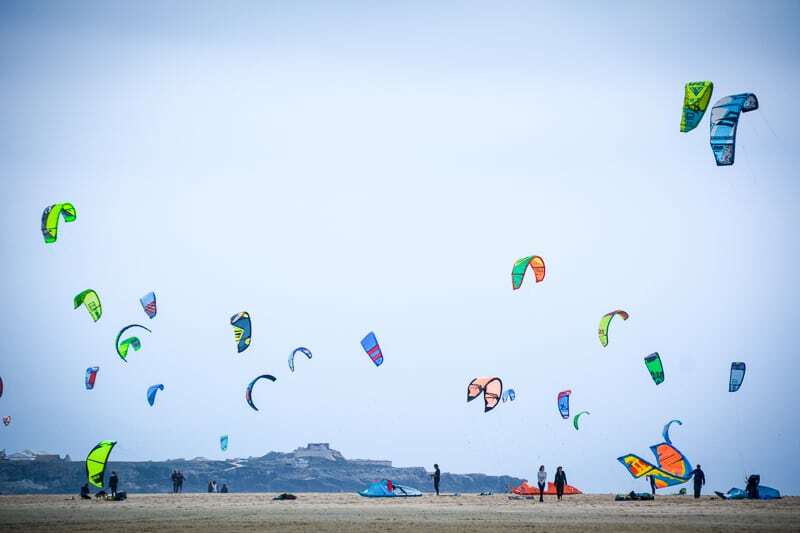 Admire the colourful kites of the kitesurfers as their dance in the stormy sky. Then head twenty minutes further north to Baelo Claudia, former Roman port town, now one of the best located and most complete ancient sites in Spain. Click here to read more about our experiences in Tarifa and Baelo Claudia. Car: Via AP-7, approximately 2 hours, with tolls. Bus: Avanzabus, minimum 2 hours 30 minutes. Another family-friendly activity on the Costa del Sol, which is easy to reach from Málaga, is a ride in the Teleférico in Benalmádena. This is a cable car which takes you to the peak of Mount Calamorro. From up here, enjoy the views from the café and take part in one of the bird shows. There are also a couple of walking routes that you can follow which allow you to immerse yourself in the Mediterranean landscape of the Costa del Sol. A great experience for the whole family. Without a doubt, the Caminito del Rey is one of the best nature experiences one can have around Málaga. 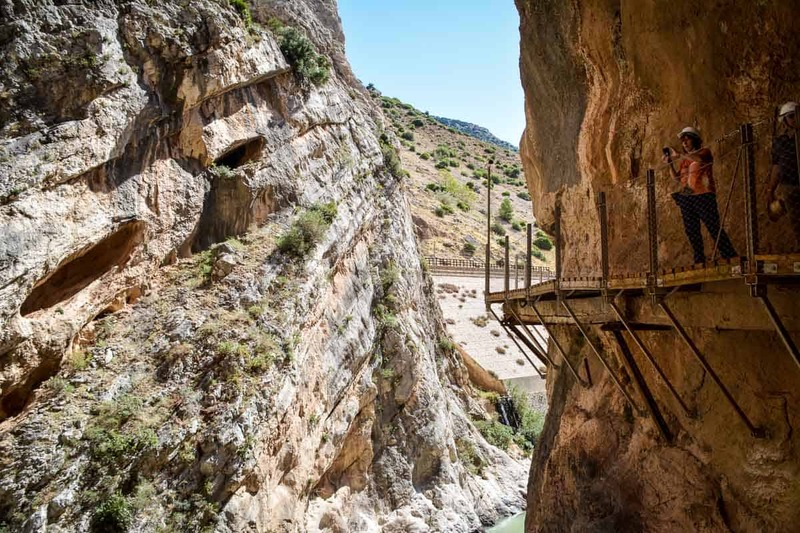 The Caminito del Rey is following the crumbling remains of a former workers’ trail that connects two water reservoirs in the Málaga Mountains. The path takes you past sparkling blue water, through verdant valleys and – in the most spectacular fashion – along the cliff face of the El Chorro gorge. Read here about our experiences and what you need to do to secure a ticket to the Caminito del Rey. Car: Via A-357, approximately 1 hour. 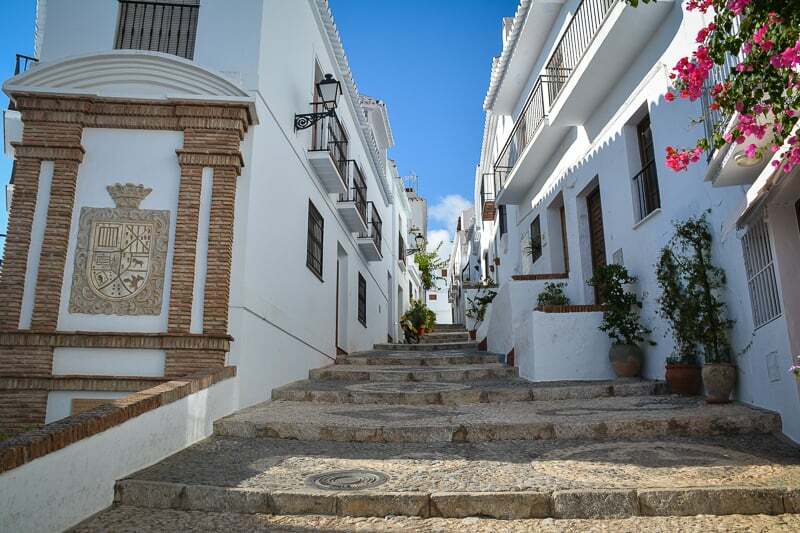 Frigiliana is one of the most beautiful white villages in Andalusia. This white village is one of our all-time favourites. Frigiliana near Nerja is simply picture-perfect with its white-washed houses, potted geraniums, tiles on the walls and views all the way to the Mediterranean Sea. You can easily spend have a day here, walking along the stepped streets, peaking into private patios and breathing the Moorish history of the place. Then spend the other half of the day in nearby Nerja to indulge in some fresh seafood or swim in the deep blue sea. Bus: Busses from Málaga will drop you in proximity to Nerja town centre, then change to bus to Frigiliana. More info here. 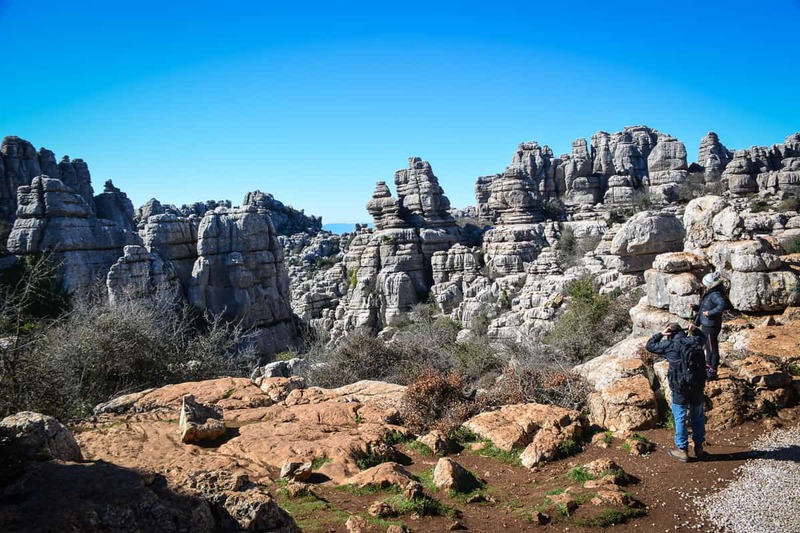 Torcal de Antequera is a landscape of bizarre shapes and formations. Ever pictured yourself hiking on the bottom of an ocean floor? Well, at El Torcal, just north of Málaga, you can do exactly that! Today, El Torcal is a mountain range and nature reserve, but a long time ago it was indeed an ocean floor. Thanks to the forces of erosion, the stones and rocks have been shaped into the most bizarre formations, making this amazing Andalusian nature experience fun for the whole family. Two easy hikes to choose from, entry is free. More info in our article here. Car: Via A-45 and A-7075, approximately 60 minutes. 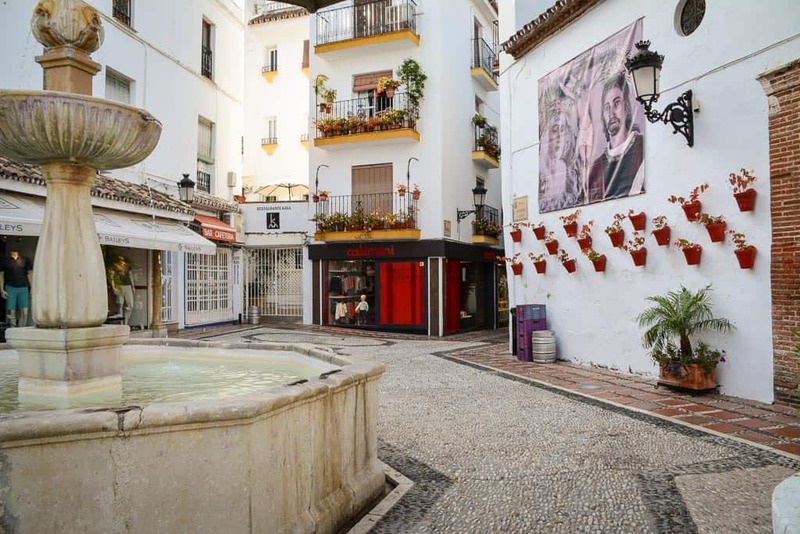 Marbella’s charming town centre is perfect for a stroll, to shop some pricey souvenirs and of course for people watching. The first time I visted Marbella I was in for a big surprise. I really didn’t expect Marbella to be so pretty and so romantic. But yes indeed, Marbella’s old town is worth a second look, not just because of the century-old architecture. In particular the area around the Plaza de los Naranjos is charming with its fragrant orange trees and nice decorations. Browse the many boutiques, marvel at the randomly placed street chapels, and enjoy a glass of vino in nearby Puerto Banús. The Lion Court at the Alhambra in Granada, just one of the many reasons why you should visit the Alhambra at least once in your life. Granada is one of the highlights of any trip to Andalusia. If you are looking for a one-of-a-kind day tour from Málaga, then Granada needs to be on top of your list! 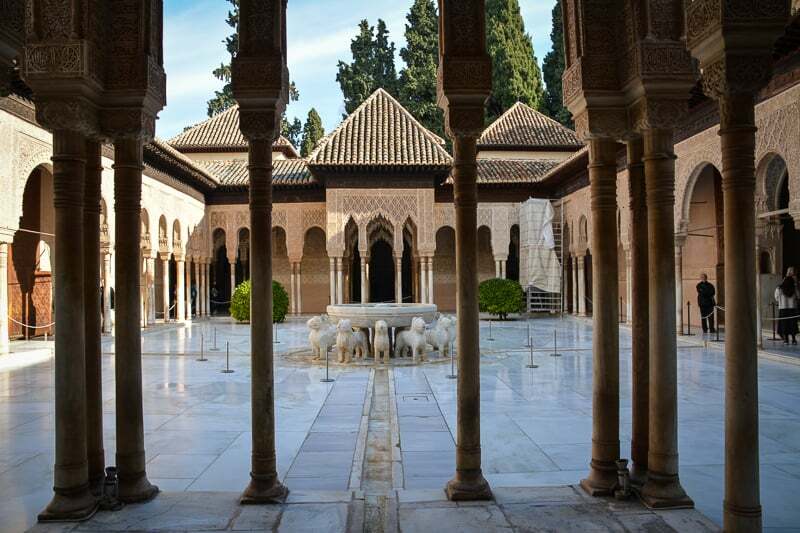 Main attraction in Granada is of course the Alhambra with the gardens of the Generalife (we explain what to see and how to visit the Alhambra in this post). Yet, Granada has so much more to offer, for example a charming old town with views of the Sierra Nevada, beautiful churches (read more about it here) and the cave houses of Sacromonte. 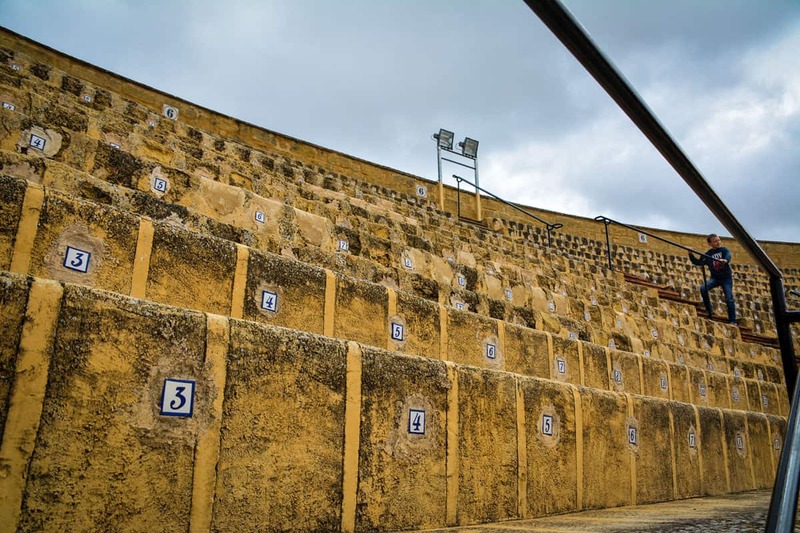 Osuna’s Plaza de Toros is one of the most visited sights, not just because it was used for the filming of Game of Thrones. You can easily explore all areas including the backstage parts of the bullring. Osuna is not very well known but definitely worth the trip. The town is located halfway between Málaga and Seville, so a possible stop when planning a day trip to Seville but also a worthy stand-alone destination. Osuna’s town centre is pleasant and easy to explore and packed with splendid baroque palaces by the nobility. Plus, visit the city museum to see the exclusive Game of Thrones exhibition – Osuna’s bullring was used as a shooting location. A must for any GoT fan. Check out our travel blog post about Osuna here. Car: Via A-45 and A-92, approximately 1 hour and 30 minutes. Bus: ALSA bus, approximately 2 hours and 30 minutes. 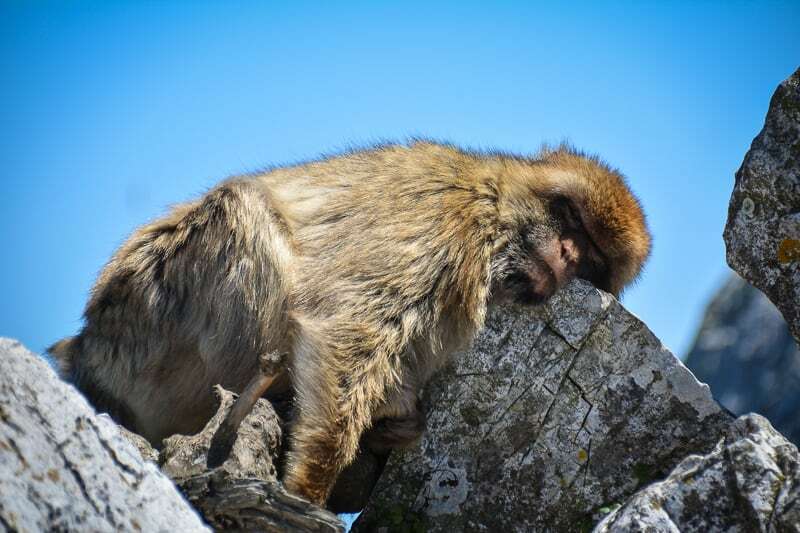 This relaxed monkey calls Gibraltar’s The Rock their home. They are the only wild monkeys living in Europe, and they love the attention of visitors! The British enclave is a great day trip from Málaga for several reasons. First of all, visting Gibraltar means crossing a border (and an airport runway) and with this comes a very distinct culture and history. Second, you can see in Gibraltar the only monkeys in the wild, and they are extremly cute and great for holiday snaps. Lastly, Gibraltar is popular as a shopping destination (as long as you stay within the customs limits). There are some things you should know before visiting Gibraltar, read our top tips here. Car: Via AP-7, approximately 1 hour and 45 minutes, with tolls. Bus: There are no direct busses to Gibraltar, you would have to select a route to La Línea de la Concepción on the other side of the border. Travel time 3 hours. 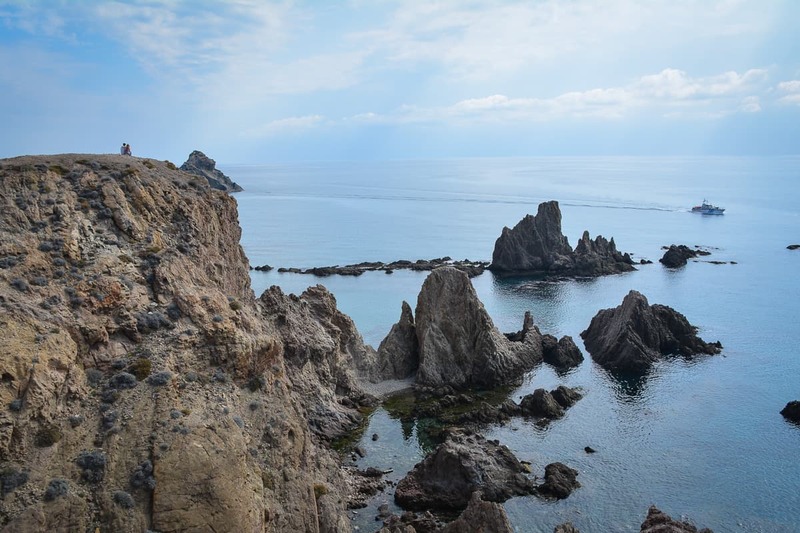 Cabo de Gata Nature Park is one of the most beautiful places in Andalusia. Deserted beaches and rugged mountains meet a magical volcanic landscape. Cabo de Gata is an unspoilt nature reserve in the very east of Andalusia. It’s a bit of a drive to get there from Málaga but the beautiful landscape is well worth the trip. You will find here some of the most beautiful beaches in Spain (alas, packed in summer, unfortunately), lots of abandoned buildings (windmills, farms, even a goldmine), and a bizarre landscape of saltpans, tall peaks and sandy plains. A treasure trove for hikers, bikers and photographers. Read here about our unforgettable trip to Cabo de Gata. Car: Via AP-7, approximately 2 hour and 45 minutes, beware of the speed cameras! In 2016, the Dolmens of Antequera were added to the list of Unesco World Heritage Sites. The 6000-year old complex consists of three sites which are in exceptionally good shape. They definitely make a great day trip destination for visitors who are interested in neolithic prehistory. One of the dolmens is constructed in relation to El Torcal, about half an hour drive away, so it makes sense to visit both places on one day to make the connection. Entry is free, Mondays closed. Car: Via AP-45, approximately 45 minutes. Train: Change at Antequera-Santa Ana for Antequera-Cuidad. It’s a 20 minutes’ walk from the station. Bus: ALSA bus to Antequera, approximately 50 minutes. 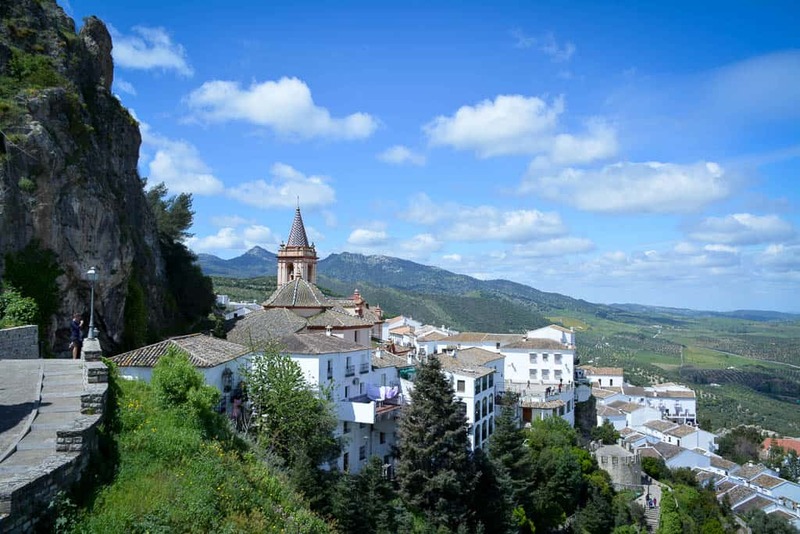 Zahara de la Sierra is considered one of the most beautiful white villages in Andalusia. From its elevated position one can enjoy the most beautiful views of Sierra de Grazalema. 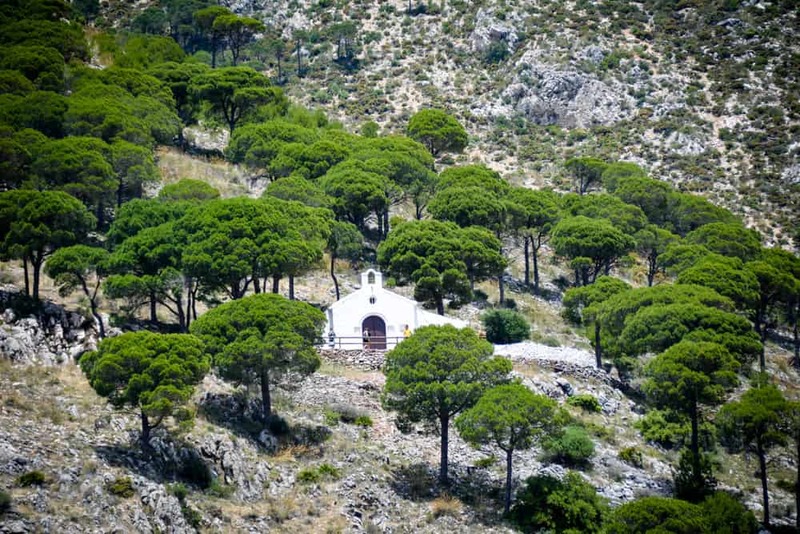 Sierra de Grazalema is a mountaneous nature resort just behind Ronda which is dotted with pretty white villages. The untouched landscape is covered in thick forests of firs and pines, intersected by deep valleys and steep mountain peaks. Visit Sierra de Grazalema for a hike on one of the designated paths, to tour the many pretty villages such as Grazalema or Zahara de la Sierra, or simply to enjoy the views from the car window on a road trip. We wrote more about this gorgeous part of Andalusia here. Car: Via A-357 and A-367, approximately 2 hours and 30 minutes. With Africa so close to Spain, it would be a shame not to consider a sneaky Morocco day trip from Málaga. Who can resist the lure of camel rides, exotic foods and colourful markets? To get to Morocco from Spain, drive to Tarifa and take the ferry. Make sure you fill in the customs declaration while you are on the boat, then use a local guide to get around. Be prepared for long queues at the customs desk in both direction. This forum post sums it up nicely. Car: Via AP-7 to Tarifa, approximately 2 hours. Leave car in Tarifa, then catch the ferry to Tangier. Views of Cádiz from Tavira Tower. The port city of Cádiz is like a shiny pearl surrounded by the endless blue of the Atlantic Ocean. Visit Cádiz to experience the glory of Spain’s seafaring days, climb Tavira tower for some outstanding views, indulge in the extraordinary tapas scene. 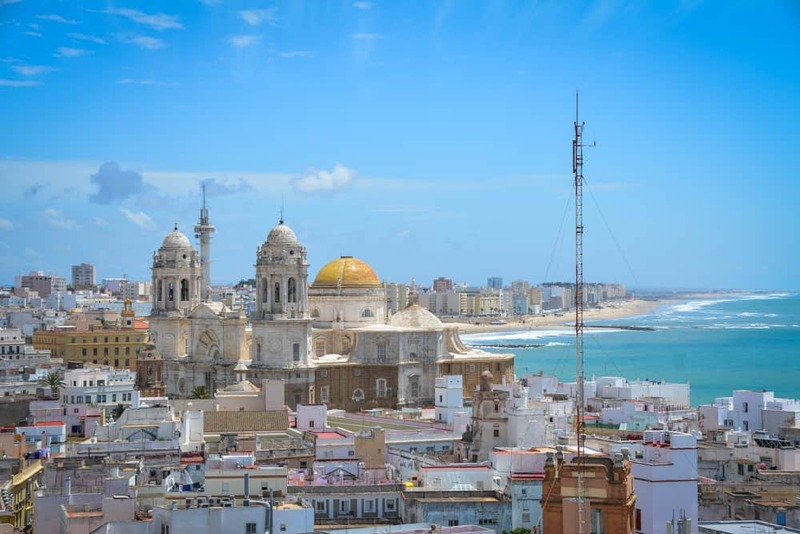 We have written about Cádiz earlier, read more about things to do in Cádiz here. The golden Mihrab door inside the beautiful Mezquita in Cordoba. 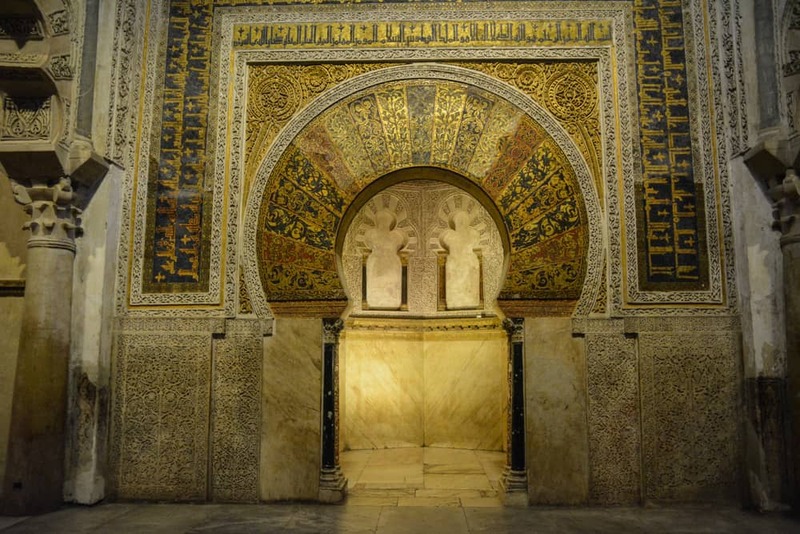 There are many reasons why Córdoba would be a suitable day trip destination from Málaga but the most important one is definitely the Mezquita. This glorious building with its giant golden keyhole arched doors and hundreds of columns from around the ancient world is a wonderful example of Islamic art in Spain. Inside, you will even find a Christian cathdedral which is equally impressive. Plus, the charming old town and the Royal Palace with its delightful water garden both are great places to visit. We simply love Córdoba! Car: Via AP-45, approximately 1 hour 45 minutes. Train: With AVE to Madrid, get off at Córdoba, approximately 1 hour. Bus: ALSA bus, approximately 4 hours. Papaneira in the Alpujarras. The water channel in the middle of the road is typical in the region. Las Alpujarras is an area in the foothills of the Sierra Nevada which was the last refuge for the Moors after the Reconquista. Because of that, the village architecture in the mountains follow the ancient designs of north African Berber tribes. On the terraces, olive and citrus trees grow, while water is channelled through smart irrigation systems through the villages and to the crops. Visit the area for sightseeing, hiking, shopping and authentic culinary experiences (read here how we enjoyed kit stew and rabbit at one of the family owned restaurants). Since time is short, stick to Pampaneira, Bubión and Capileira. These are our top 20 day trips from Málaga. Did we miss an important destination? Let us know in the comments!